Looking for a great romantic getaway for spending your honeymoon or anniversary? Well how about spending it on a Russian river cruise? It offers a great way to experience Russia with your loved one. Russia has a lot to offer when it comes to cruise holidays. Endowed with magnificent cities and world class museums and historical towns, Russia’s waterway alone is already remarkable. 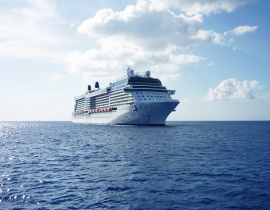 Most ocean liners are able to travel all the way from the Mediterranean to the Arctic. Moscow is connected by rivers and canals to five seas namely Aral Sea, Baltic Sea, Black Sea, Caspian Sea, and the Sea of Azov. The river cruise runs in three main areas: Central European Russia, Northwestern European Russia, and Asian Russia. The most popular package in a Russian cruise holiday is the Moscow to St. Petersburg river cruise. The tour takes between 7 to 10 days plus an additional day or two for the land tour in each city. Covering 650 kilometers, the cruise takes you to 10 different rivers, canals, lakes, and reservoirs. The land tour includes a visit to various attractions in Moscow such as the Red Square, the Kremlin, the Tretyakov Gallery, and the Bolshoi. In St.Petersburg, you get to visit the Hermitage Complex, Peter and Paul Fortress, Peterhof, and the Mariinsky Theater. River cruises also let you experience a glimpse of Russian life in the countryside and villages along the riverbanks. With the help of specialist guides, you get to know more about the life, culture, art, and politics in Russia. Other activities include poetry readings, and classical concerts. There are also vodka tasting, cooking demonstrations, and some basic language lessons. One of the most popular river cruises in Russia is a trip along Volga River. It is the national river of Russia and is the longest in the European continent stretching 3,690 kilometers. Known as the Queen of Rivers, it flows southeast and spills its waters into the Caspian Sea. A trip along its bank provides tourists with a glimpse of a wide variety of species such as beavers, otters, different kinds of birds such as herons and bald eagle. The Volga River is home to one-third of the population of Russia who makes their living along its banks. The likes of Moscow, Novgorod, Nizhny, and Volgograd rely on the river for commerce and tourism. It also serves as a key transport route for reaching the other parts of the country. There are many river cruises that traverse these waters such as the Volga Dream. The options include small vessels all the way to the full-sized cruise ships that offer single and luxury amenities that can truly make your honeymoon or anniversary a dream one. So if you want a truly romantic getaway with your loved one, try out these river cruises.